We recently met lovely a Dutch lady called Marleen who has relocated to Spain after retirement as a teacher in Holland. 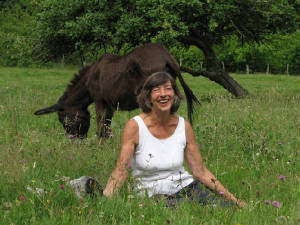 She bought a large area of land here in Asturias and opened up a sanctuary for old and retired Donkeys. We have decided to try and help out a bit by promoting the sanctuary and helping her and the volunteers to raise funds and attract other volunteers. Marleen works extremely hard and not only looks after 17 Donkeys, 3 horses, 4 dogs and two cats, but also cooks for and looks out for the volunteers she has visiting and helping out. There is always a lot of land management work to be carried out such as repairing fences, collecting apples, clearing brambles, tending trees and excavating dumped rubbish. The Donkeys also require daily care: grooming, feeding and watering, stables need to be cleaned and healthcare needs are monitored. 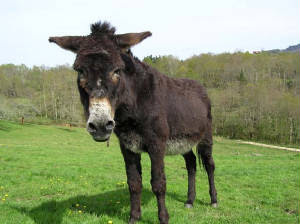 The Paradise for Donkeys (El Paradiso del Burro), is situated in a lush green valley covering 8 hectares and has extensive meadows, large apple orchards and several wooded copse. We are currently working on developing the website and preparing a bi-lingual blog so have a look at the link and bookmark it for future use. We are lucky that our house is very near the Oriental Coast of Asturias, a well known stretch of the asturian coast that is famous both for its numerous sandy beaches and its dramatic limestone cliffs, over 50km of coast stretching from the boundary between Asturias with Cantabria in the east to Ribadesella further west, Ribadesella is the municipal district where we live. If you continue along the coast from Ribadesella, further west, you will enjoy many long sandy beaches but the cliffs are not as impressive. We have always enjoyed walking and from La Pasera there are several walks that we can choose from that will take us along the coast. One of our favourite walks takes us to a bay where the Guadamia river meets the sea, where there is a nice picnic area, a lovely sandy (but tidal) beach, excellent views of the mountains, the cliffs and the coast. Sometimes we walk there following the quiet country lanes whilst other times we walk through our village and pass the little chapel to a path that will lead us to the spectacular cliffs and eventually to the picnic area were we can sit and enjoy the views. It is always a pleasant and enjoyable experience to walk to Guadamia whether you do so along the cliffs or the lanes. Sometimes when we conicide with low tides we walk along the beach and river banks where we occasionally see a kingfisher, quite often you just notice its bright blue plumage as it flies along the river. In Summer we sometimes take a towel and go for a swim in the sea before we return home. The views of the sea, the cliffs and the mountains are always impressive. Today we are having rough seas and we decided to walk up to the coast and enjoyed watching the strong sea crashing againts the cliffs with the waves coming over the cliffs. Today we also had spectacular Bufones, these are plumes or blow holes of sea water vapour coming up the ground, through fissures in the limestone - mostly when the rough seas coincide with the autumn and Spring high incoming tides. You can also hear the noise that the water and wind make as it rushes through the numerous bufones near Guadamia. We can hear them at night breathing like a distant dragon. In a different blog entry I will tell you of another of our local walks further west towards Ribadesella that takes us to The Cliffs of Hell. The winds have arrived together with brilliant sunshine and spectacular clouds. There is an early morning and late evening chill in the air and the leaves are losing their shades of green. We have collected many walnuts and hazelnuts from around the caminos and picked figs for jam from trees around the village. No-one locally uses very much fruit apart from apples for cider and a few for eating, therefore lots to be had for free. 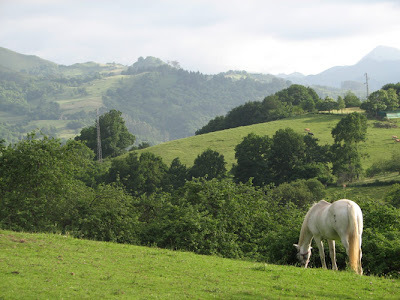 We have undertaken several walks in the Redes National Park, the coast and the woodland of Peloño in Ponga. We were hoping to see the autumnal colours in the beech forests but we were probably a couple of weeks too early. We did however see some beautiful semi-wild horses and some fantastic landscapes. The light has changed recently and now has an Autumnal glow that has altered the colours of nature. Here are few pictures taken on local walks. Click on each picture to get a bigger view.